This innovative Arianex Double lever arch file contains two lever arch files in one with a double 50mm D-ring filing capacity for up to 1,000 sheets of A4 paper (500 sheets per mechanism). 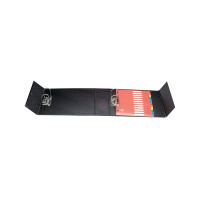 Made from durable PVC covered board, the file features a complete wrap around cover and press stud fastener. This pack contains one black A4 lever arch file.